As promised, here’s the audio and video of our G-Fest Conference panel, which took place at 3:00pm (CDT) on July 13, 2018 at the Crowne Plaza O’Hare in Rosemont, Illinois. We had a larger-than-expected turnout, including several attendees who were listeners and a university professor who was impressed with our presentation. If he was amazed, we know you’ll be, too! In this, we discuss Godzilla (1954), The Return of Godzilla (1984), Shin Godzilla (2016), and Godzilla vs. Gigan (1972), and the international relations issues that were surrounding them when they were made. We introduce ourselves, the podcast, and its mission. Then Nate examines the 1954 and 1984 movies with respect to the JSDF, the US-Japan Alliance, and Japanese domestic issues. Brian then updates the audience on what has happened in Japan and the world between 1984 and 2016. Nate examines the 2016 movie across the same issues. Brian analyzes Godzilla vs. Gigan and all that the movie communicates to the audience about globalization. Brian finishes the panel by mentioning what all will happen to Japan in 2019 and 2020, and gives a spirited case for defending democracy. 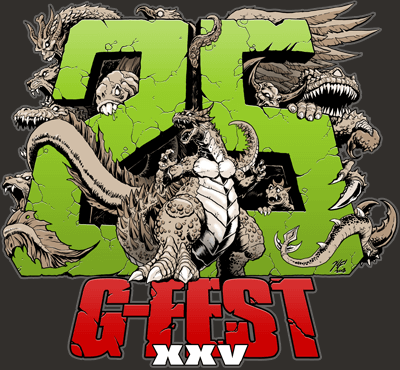 We’re just one week away from G-Fest XXV! The show will be held July 13-15 (with some preliminary events July 12) at the Crowne Plaza O’Hare in Rosemont, Illinois. We’ll have exclusive content for our Patreon supporters throughout the weekend, including pictures, videos, and other updates. We’ll also give supporters exclusive early access to the recording of our panel either Friday night or Saturday morning. If you’d like to be a part of that, become one of our patrons on Patreon! The guests for this year include Megumi Odaka, who famously played psychic Miki Saegusa in the Heisei Godzilla films; suit actor Kenpachiro Satsuma, who’s best-known for playing Godzilla himself in all seven Heisei films; actor/wrestler/mixed martial artist Don Frye, who played Capt. Gordon in Godzilla: Final Wars; and suit and model maker Keizo Murase. Sadly, due to surgery, the great Akira Takarada, the “godfather of G-Fest,” will not be able to attend. We here at Kaijuvision Radio wish him a speedy recovery and hope he will return to the convention soon. The nearby Pickwick Theatre will be screening kaiju films starting Thursday with The Valley of Gwangi and Dinosaurus! in the afternoon and then Mighty Peking Man and Pacific Rim: Uprising that evening. There will be a screening of Rampage, starring Dwayne Johnson, Friday night and a special screening of Godzilla and Mothra: The Battle for Earth Saturday night with an introduction by Megumi Odaka (and, I assume, Satsuma-san). We can’t wait to spend an exciting weekend with our fellow G-fans and kaiju lovers!